Instead of trying to bring its touchscreen app up to par with the desktop version, Skype will just discontinue the app altogether. With Windows 10 looming, Skype no longer wants to have one app for touchscreens and another for mouse-and-keyboard. As such, Microsoft is killing off Skype’s modern touchscreen app for Windows. Starting July 7, anyone who tries to use this app on Windows 8 or higher will be redirected to a download page for the desktop version. The news doesn’t affect Skype’s modern Windows Phone app, and Microsoft says nothing will change for users of Windows RT tablets, such as the Surface and Nokia 2520. Presumably, that means Windows RT users will still have access to the app, though it’s unlikely they’ll receive any updates. Why this matters: As Skype acknowledged in a blog post, users have complained for years about disparities between the modern and desktop apps. While the modern version is somewhat easier to interact with on touchscreens, it’s far too dependent on swiping to see all information. It also doesn’t include some features from the desktop program, such as screen sharing and group video calls. Although Skype has said in the past that it was “working hard” to bring the two version in line, those plans have apparently changed. The writing might have been on the wall, as Microsoft recently revamped its desktop app design and integrated the Skype Translator Preview. Wither Windows 10 universal apps? Strangely, Skype cited Windows 10 as a reason for abandoning its touchscreen app, but said nothing about offering a universal app for the upcoming operating system. A universal app would bestow a couple of distinct advantages: First, it would allow Skype to distribute its software through the Windows Store, allowing users to automatically get updates and easily re-download the app onto new PCs. It would also let Skype have a single app that works across phones, tablets, PCs, and the Xbox One. 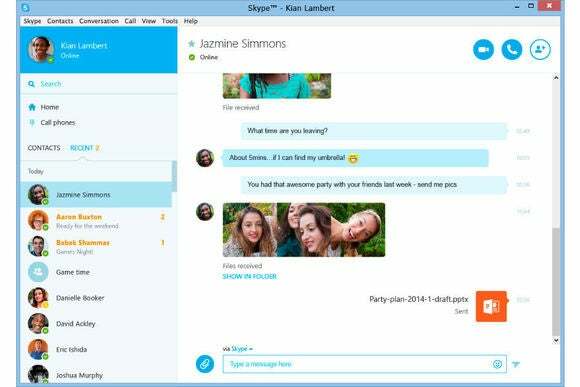 As it stands, Skype offers separate apps for each of these product categories, and distributes its desktop program through Skype.com. That’s not to say Skype won’t go universal after Windows 10’s launch on July 29. Microsoft is working on tools to convert desktop programs into universal apps, and it’d be downright shocking if Skype didn’t lead by example. Still, some of the details on this program are unclear, which might explain why Skype isn’t talking about it. In any case, it’s interesting that Skype is heading in a different direction than Microsoft Office, whose upcoming touch-friendly apps will be completely separate from the main desktop Office suite. Arguably, desktop Office is such a complex piece of software that merging it with the touch version just isn’t feasible right now.